So I've had my Antec Twelve Hundred case for a while now, as I've been accumulating more and more parts (last of them are on their way!). Before I had it, I had high expectations. When I got it, my expectations were surpassed. As you can see, this is already going well. Anyway, I have no need to wait until its completely put together to review it. So here it goes! Computer cases are supposed to hold computer components, right? 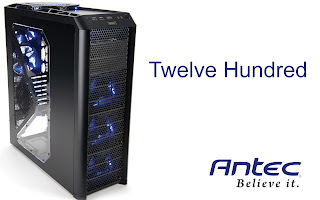 Well, the Antec Twelve Hundred does this more efficiently than most computer cases. See, most computer cases are what we call mid-towers. This is a full-tower. So first of all, it's a heck of a lot bigger than the average computer. Bigger equals better when it comes to storage. Just don't expect to move this monster as it weighs in around twenty pounds alone. As for containing parts, the Twelve Hundred has a panel for all of your cords to snake around underneath the motherboard and come up closest to where it needs to connect. 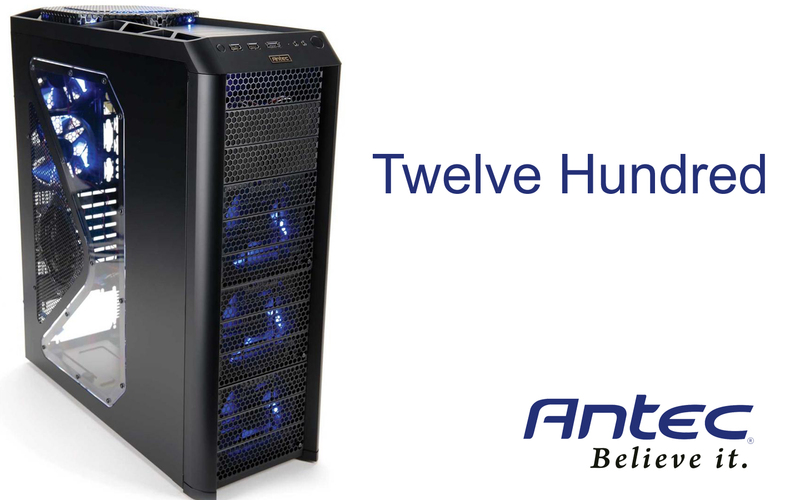 When it comes to cooling, the Twelve Hundred has 6 built in fans, all with blue LEDs and adjustable speeds. In this video, you can see the the computer in the light and dark, on and off, and low and high settings. (Sorry for bad quality!) On high power, the thing is moderately loud and actually creates a slight breeze in the room. There are slots for two more fans and there is tons of space inside for other things. It can hold up to twelve hard drives and various other things. It has a platform for water cooling as well as holes to route tubes outside. All I have to say here is that installing the motherboard, and doing anything inside of it has been extremely easy. You can take the side off by turning the knob/screws with your fingers. All in all, everything is really easy to do. Made mostly of steel, this case is practically unbreakable. Amazing really. Everything but the top and and some places is made of weird matte plastic that feels weird to the touch. Other than that, the thing is amazingly well built. The other thing that may be good or may be bad, is that the side isn't a door. It just comes off. I personally prefer a swinging door, but I can see how that would be harder to work with. If you watched the video, there simply is no arguing that the case is amazing looking. It's huge, made of steel, and covered in lights. What more do you want? Coming in at around $150, this full tower is a steal. It is one of the cheapest full towers that you can find, but even then full towers seem so much more expensive when compared to mid towers. So really, the huge price jump between mid and full is my only problem. In my opinion, you won't find a better full tower computer case of this quality for this cheap anywhere. The biggest rival is the Cooler Master full tower, but even then, that prices in at around $200. Despite some weird plastic on the top, the lack of a swinging door, and the huge price differece between full and mid tower cases, this is pretty dang close to a perfect case.